Liv loved Project Ed Bear for the joy that it brought her. While in the hospital, she received a Project Ed Bear teddy bear and had fun playing in the Ed Bear Cave in the waiting room. She enjoyed the TV's and DVD players Project Ed Bear provided in the patient rooms and the movies and DVDs. She enjoyed Ed Bear Camp every June and the Gala every November. At Ed Bear Camp, she enjoyed arts and crafts, dancing, decorating her cabin with the other girls and catching her breakfast "pancakes"!!! This is where she met Susan Summerville and they became great friends! Susan and Liv shared a passion for art and enjoyed that time together. Liv loved the Gala every November as it made her feel so special to receive her Bravery Award and to have a piece of her art, that was specially made for the Gala Auction, auctioned to help raise money for Project Ed Bear. She also loved getting dressed up & this was the perfect occasion! Susan always made her feel so loved & special! I love Project Ed Bear for all of these reasons and more. As a parent, to have an organization show such love, care and generosity to your child, during the most difficult times in their young lives, is precious & means the world to me. It touches the deepest part of a parents’ heart. I'm very grateful for them! On December 18, 2016 at just five months of age, Amelia was admitted into Akron Children’s PICU after discovering a large brain tumor encompassing almost the entire right hemisphere of her brain. Amelia was subsequently diagnosed with a grade IV Primitive Neuroectodermal Tumor (PNET). Since then, Amelia has courageously battled through two craniotomies to resect the tumor, four rounds of intense chemotherapy, and two autologous stem cell transplantations. She spent more than 180 combined inpatient days at the hospital under the care and direction of her wonderful team at Akron Children’s Hospital. Amelia showed us how unbelievably brave, strong and fierce she was through many complications and moments of uncertainty. We are beyond grateful that our Millie is currently disease free and able to undergo daily rehabilitation. Thanks to the wonderful doctors, practitioners, nurses and all other staff at Akron Children’s, Amelia continues to make strides every day. We first learned about Project Ed Bear soon after being transferred to the oncology floor at Akron Children’s Hospital when their teddy bear arrived in our room. Spending almost every holiday at the hospital, Amelia and her brother Blake received many gifts from Project Ed Bear such as Easter baskets, Valentine’s Day cards, coffee for parents and other gifts to help brighten our days. Co-Founder Susan Summerville even sat with us during one of Amelia’s surgeries, this shows how involved and passionate they are for the oncology kids and families. Thank you, Project Ed Bear, for all your love and support!! Project Ed Bear means so much to my family. Their work begins on the day of diagnosis. It starts with a bear. A simple bear. One might think that's not a big deal. To a small child who is being poked and prodded by several strangers while their parents cry over them, that bear means everything. The care bags they provide to parents who are far from home with nothing but the clothes on their backs; those bags are crucial. The days to come will be rough and exhausting. Yes, sitting in a hospital bed is exhausting. Not knowing what comes next is exhausting. But our girl made time pass more comfortably utilizing the items Project Ed Bear provides to the oncology unit. Video games and movies are life for a child who is forced to sit in a bed all day. Presents gifted after a tough procedure are the biggest incentive for a child. Project Ed Bear provides those presents. There is nothing more comforting in the world to a parent than the moment your baby wakes up from sedation and smiles at a new toy. That's the moment you know, she'll be alright. She made it through this one. I lost count of clinic visits years ago. Our baby used to cry and fight every time we walked into the hospital because she didn't know how long we would end up there. She just wanted to go home. The little presents in the clinic were her #1 goal. Those presents were the only thing that would calm her down. We could never leave the clinic by the end of our appointment because the bear cave was just too much fun to walk away from. At the end of her very long treatment, a party was thrown for her by the staff and sponsored by Project Ed Bear. Complete with a personalized boutique cake. Now that she is cancer free, we enjoy our outings that the Liv Thru Art program provides. She learns a new skill each time. It also gives us a chance to keep in touch and socialize with other cancer families. As she gets older, we cannot wait to experience Camp Ed Bear and everything it has to offer as far as learning skills and socialism. We look forward to that milestone soon! Every year, we attend the Project Ed Bear Annual Gala. This is the absolute highlight of our year. Our baby walks the red carpet as a VIP. She receives a gift bag filled with goodies. Most importantly, she gets her award. A trophy made of glass (she says diamond). It marks another year that she is here with us. It's our yearly reminder of pure triumph. It’s a day that we give hope to those who are fighting, celebrate those who have beaten their disease and remember those who are no longer with us. It's a day that we hold dear to our hearts. When Kayli was 8 years old, she went to the doctor for her well child check-up. Upon examination, our doctor felt a large mass in her abdomen and sent us to Akron Children's. 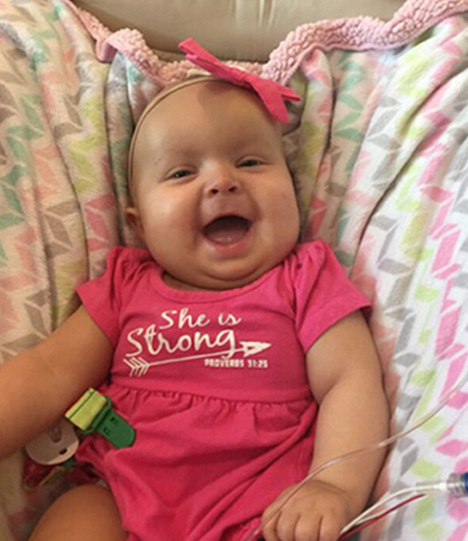 After a whirlwind of tests and then surgery, Kayli was given the diagnosis of Ganglioneuroblastoma. Her tumor was the size of a grapefruit and they were not able to remove all of it, due to it lying along the Vena Cava. For the next four and a half years, she was followed closely with scans and tests to monitor the residual cells. Almost five years after diagnosis, she had another tumor grow, which required removal again. The same amount was removed, only this time she contracted a staph infection in her 10-inch incision. She had surgery again and had to have a wound vac and stay in the hospital for a while. After 3 months of healing, she was able to resume activity and continued monitoring by the hospital. Another year later, she had 3 tumors comeback at once. More surgery, but a complete tumor resection this time! She then began chemo, which her body did not tolerate well at all. Her blood counts dropped and just did not want to recover well. 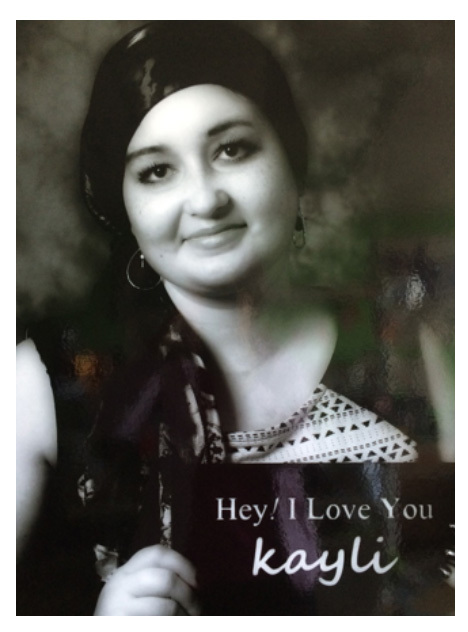 She had to end her chemo early due to her body’s inability to handle more. She then completed 16 radiation treatments, which left her body more weakened. In September 2012, her tumors began spreading once more. She had disease in her spine, shoulders, hips, arm, leg and pelvis. She completed more chemotherapy, radiation, 2 MIBG treatments, 2 stem cell rescues, multiple Kinase Inhibitors and was taking some custom chemo treatments experimentally to try and keep her disease from rapidly progressing. The treatments failed to slow the cancer down and it invaded many areas of her body. In October 2015, Kayli entered hospice care at Akron Children’s Hospital and lived each day to the fullest from her bed. She decided that she would make the most of her days by loving big and pointing everyone she met to her hope in Christ.